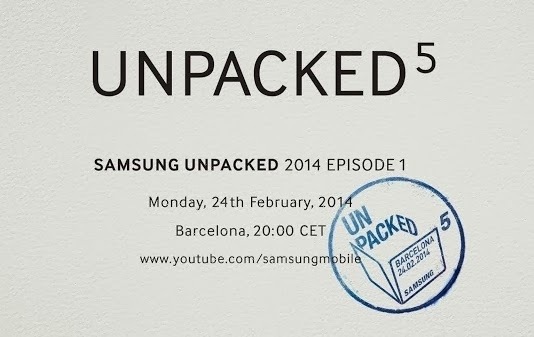 Samsung, just a couple of days before the big unveil at the Mobile World Conference in Barcelona, has all but confirmed that the Unpacked event will focus on the new Galaxy S5. There had previously been speculation that Samsung would release another Galaxy phone, saving the Galaxy S5 for its own event in March. While we had expected the new Galaxy S5 to be a significant departure from the S4, which always felt a bit stagnant, a new teaser video released by Samsung today suggests that the S5 will be a very different beast indeed. It seems that Galaxy S5 might be both waterproof and ruggedized. Yes, I’m as nonplussed by this as you are. First, watch the video above. I hope that we can all agree that the constant and frankly nonsensical use of the 5 is obnoxious. Here’s a short list of the interesting nouns that popped up during the video: wet, outdoor, alive, fit, speed, selfie, flip. Speed probably refers to the inclusion of slowmo and/or time-lapse photography. Flip and selfie I’m not sure about but again, it probably just refers to a new feature in the Galaxy S5′s camera app. The first four nouns, though, strongly suggest that the Galaxy S5 will court users with active, outdoor, and fitness lifestyles. Now, you probably don’t need me to tell you this, but waterproofing, ruggedization, and flagship smartphones do not mix well, they do, but the end result is very expensive and poorly suited to the majority of the market. Waterproofing adds build complexity and cost though Sony’s waterproof Xperia smartphones show that it can be done, if necessary. Ruggedization, though, adds size, thickness, weight, cost and, perhaps more importantly, detracts from the phone’s beauty. The Galaxy S already loses out to the iPhone in terms of size, weight, thickness, and arguably design adding waterproofing and ruggedness would only make the comparison worse. To be honest, though, the odds of the Galaxy S5 being waterproof and ruggedized are slim. Samsung would never release a flagship phone that’s so specifically tailored towards such a small segment of the market. What is possible, though, is that there will be different versions of the Galaxy S5 a normal, slick fondleslab for everyday users, and an Active version for those who need the added flexibility. It’s also worth noting that there was a rumor that Samsung would release two versions of the S5, like Apple with the iPhone 5S and 5C. In fact, given how Samsung’s Galaxy range (which basically just describes its Android-powered smartphones) has always been differentiated like this, it probably wouldn’t be a huge surprise if the S5 came in a few flavors. Hang on, I’ve just had a genius idea what if that obnoxious 5 is actually a sign that there will be five different versions of the Galaxy S5? We’ll find out on Monday at MWC. I’ll be there in Barcelona, with my handy Ruggedization Benchmarking Tool (if they let me take it on the plane, anyway).